Originally posted on Future Expat. I’ve enjoyed Nadoz Cafe for many years but have never eaten before at the Wine Bar that adjoins the cafe. I’ve been wanting to try Vino Nadoz Wine Bar ever since it opened, and finally made it over there with my friend Cathy recently. I didn’t manage to take any interior pictures, but the restaurant is quite cozy and would be the ideal romantic setting on a fall evening after the patio is closed. I know this is a terrible shot of the sign, but I took it from my seat on the patio so you would know what to look for when you headed out. 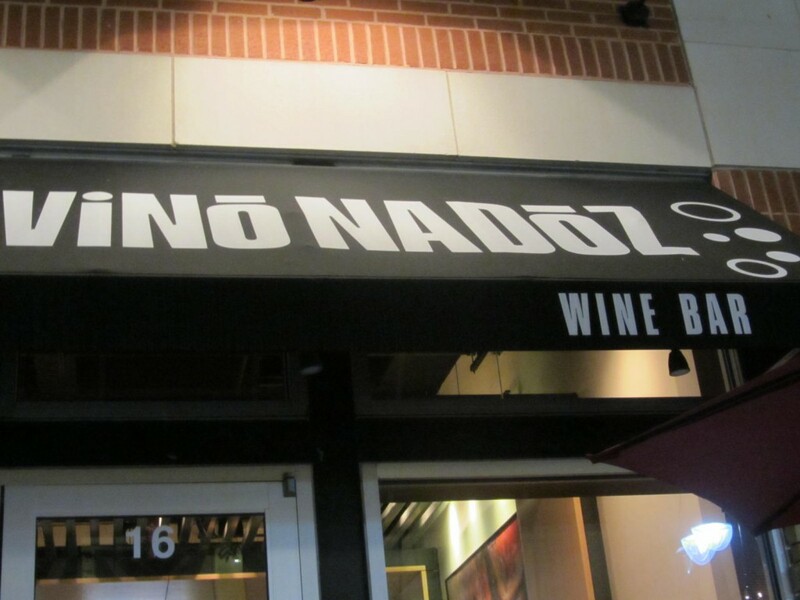 Vino Nadoz Wine Bar is located at The Boulevard, across the street from the Galleria Mall on Brentwood. Both sides of this one block street are lined with wide sidewalks, outdoor seating and fun retail stores. 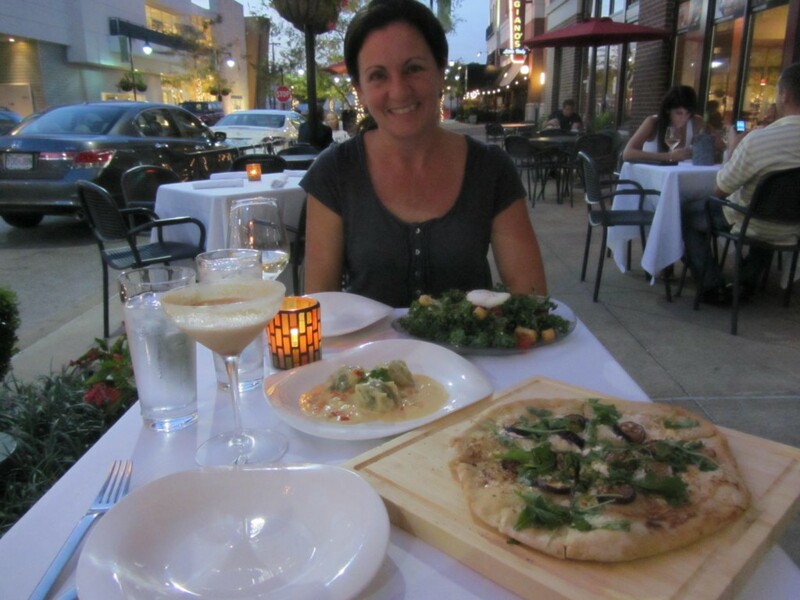 Compared to most restaurants with sidewalk seating, Vino Nadoz has a peaceful ambiance. 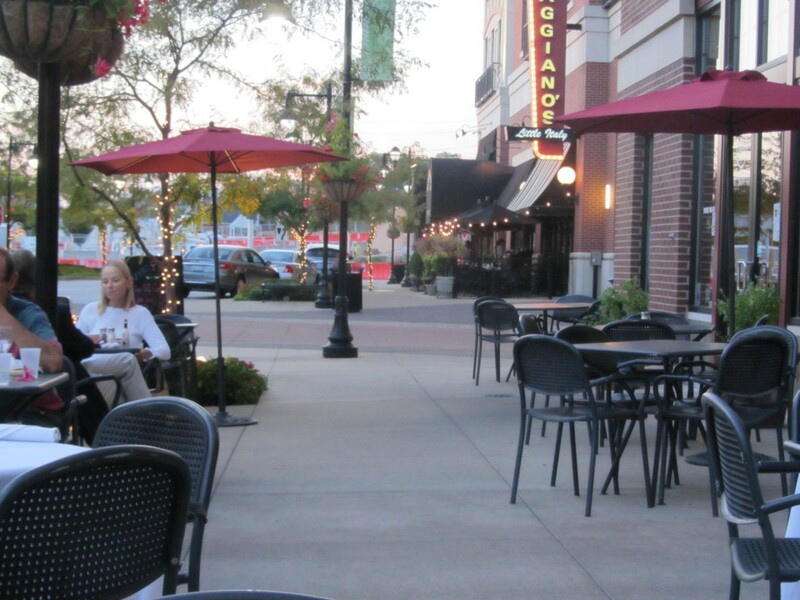 Since this street doesn’t have the pedestrian traffic you will find on South Grand, The Loop or the Central West End, there is a good chance that no one will walk by your table while you are eating. Cathy and I decided to do dinner tapas style, sharing everything we ordered. 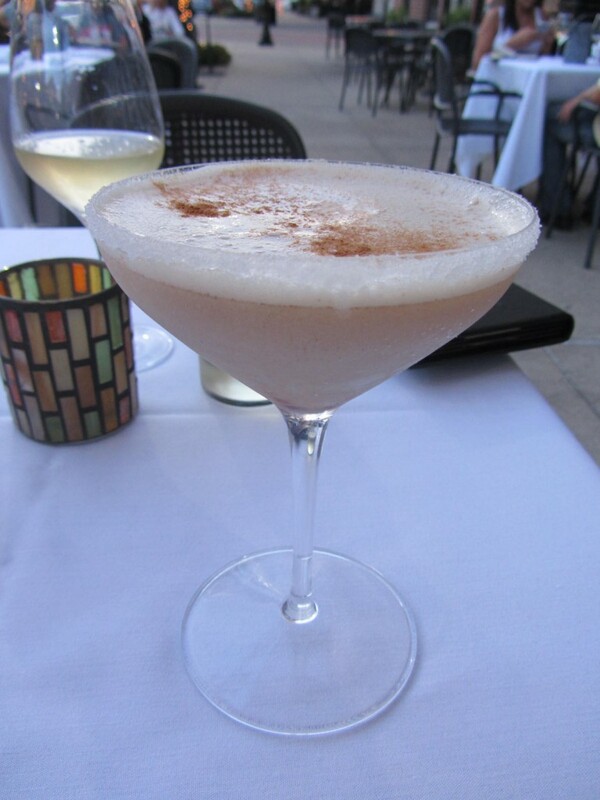 I started with a Cinnamon Sugar Martini. It was wonderful. The glass rimmed with sugar was an added touch that took it over the top. I’ve been hearing people talk about kale a lot in recent years, but have never ordered it before. For those of you who have also never tried it, you’ve probably seen it before. Kale is often used as the garnish on fruit and veggie platters. It is a thick lettuce with stiff curly edges. 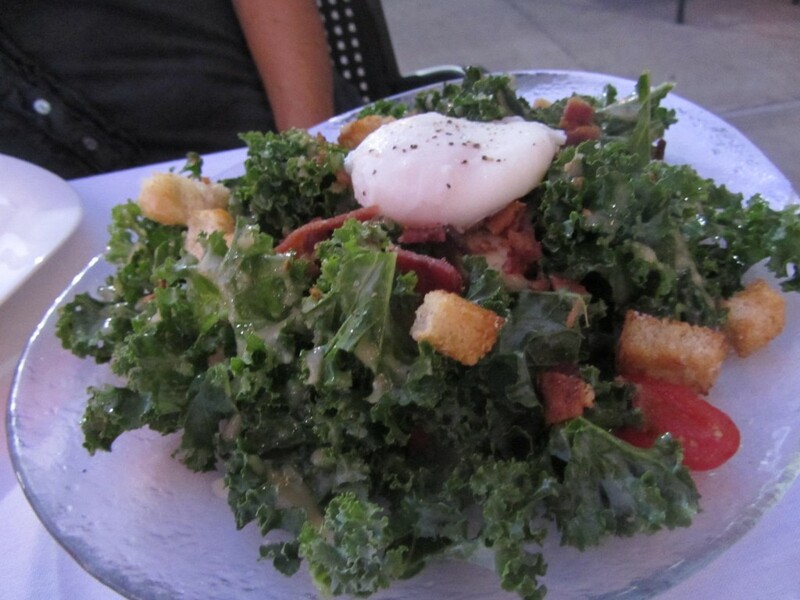 The salad contains candied pepper bacon, compressed tomatoes, roasted garlic, croutons, poached egg and sherry vinaigrette. We both really liked it, though the bacon didn’t taste very candied to me…and honestly it’s the main reason we decided to go with this salad. Next up was the crawfish and pork pot stickers. 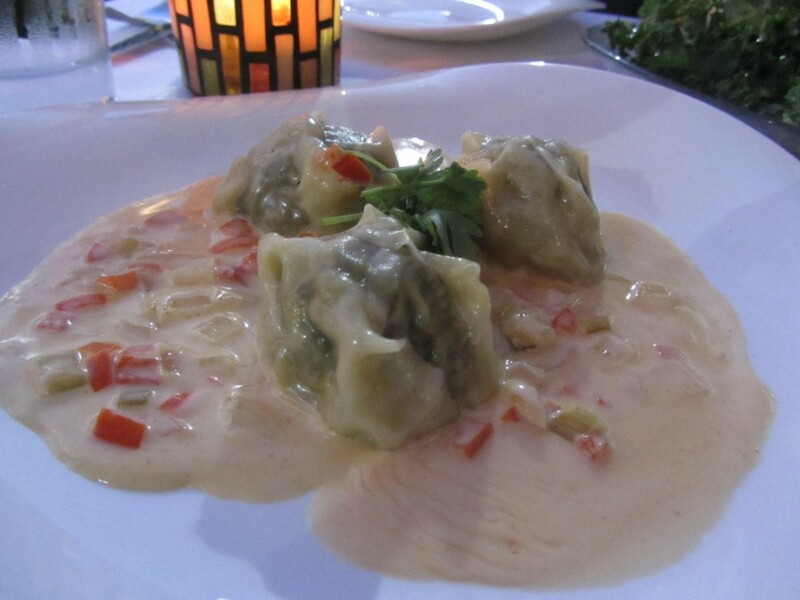 I love crawfish, and I like pot stickers, so I knew I had to try it. They were well made, but I didn’t taste much of the crawfish and the spicy sauce was a bit too spicy for me. I would probably try something else when I go back rather than getting these again, though I certainly didn’t dislike them. My favorite part of the meal was definitely the fig flatbread. I love figs, but I’ve only had fresh figs once and they were raw. 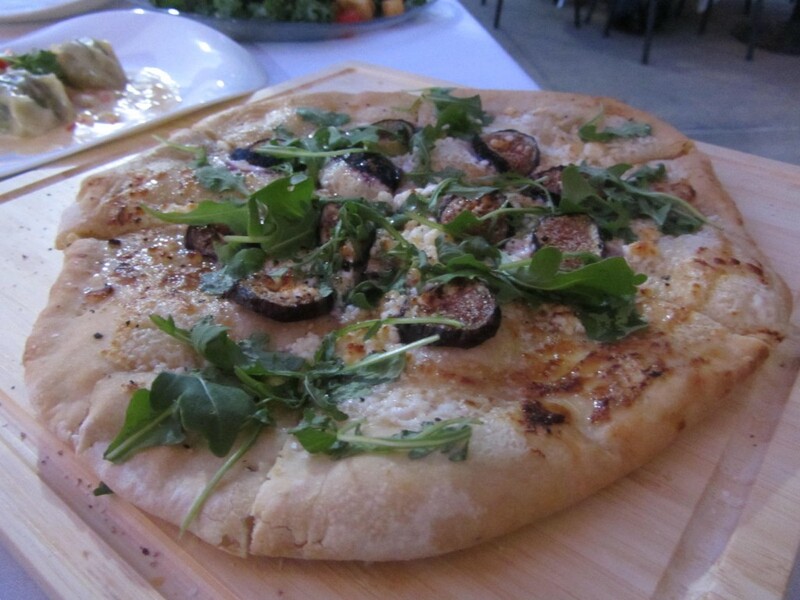 I really loved the fresh, thinly sliced figs that were roasted in on top of this pizza. They definitely taste like figs and have a sweetness that adds a lot to the dish. The flatbread pizza also included mascarpone, truffle honey, goat cheese, white balsamic reduction and some leafy greens. We asked them to leave off the serrano ham since neither of us are a big fan. I really enjoyed my visit to Vino Nadoz and hope to go back soon.